Ever notice how hard it is to co-ordinate a conference call or meeting across several locations? Yeah, us too. So we set about devising a simple to use tool that could show you at a glance when everyone is in the office regardless of their time zone. Our new Meeting Planner Trip Tool couldn't be easier to use. 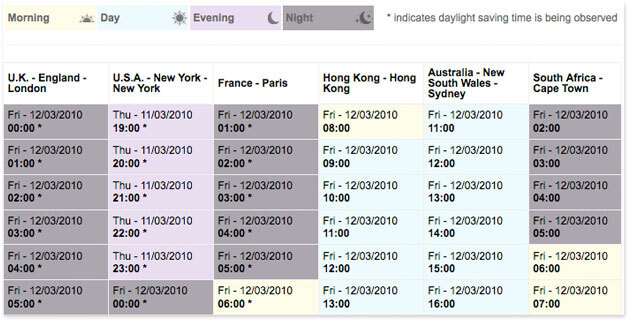 Select a date, then enter up to six locations and the Meeting Planner returns a colour-coded chart highlighting if it's morning, day, evening or late night across all selected areas. Simple! We've only just launched the Meeting Planner and we've got some ideas on how to make it even more useful. If you have a great idea for a Trip Tool, drop us a line.